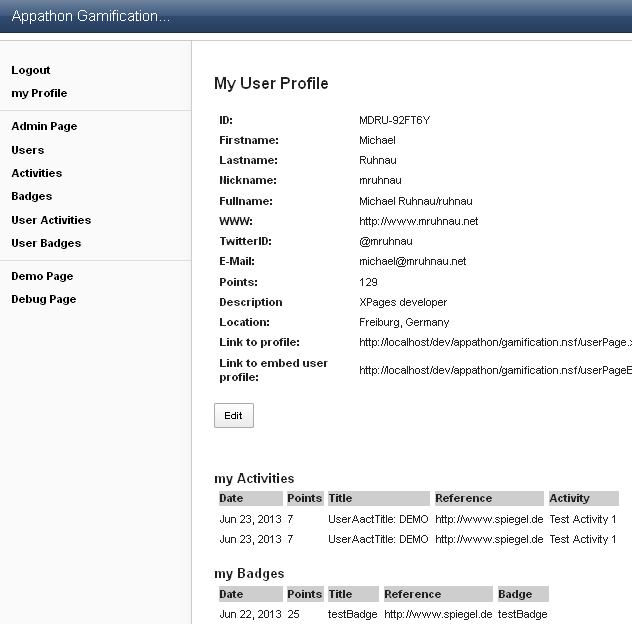 As part of the XPages development contest sponsored by WebGate Consulting AG which is part of the Appathon sponsored by IBM developerWorks, Michael Ruhnau has contributed a new project called XPages Gamification. Below is Michael's description. “XPages Gamification is an application which enables you to implement Gamification concepts in your XPages applications. In this release, the application can be used to be integrated into an existing XPages application (by copying over the design elements to your application). All data will then be stored within your application. The general concept of this application is that there are USERS who can gain reputation points and BADGES by completing ACTIVITIES in your application. An activity can be adding starting a new topic in a discussion database. You can enhance your application with a few lines of code that a user gains reputation points when he saves a newly created discussion topic. The same concept can be applied to badges. - Embed User Page into your Apps"